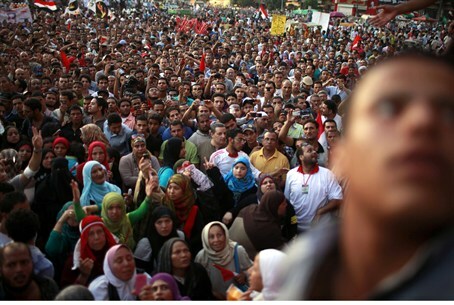 Muslim Brotherhood calls decision "a complete coup" erasing the achievements of the rebellion against Mubarak. Egypt's constitutional court ruled on Thursday disqualified the country's parliament, just two days before presidential elections. The court ruled that one third of the seats in the Islamist-dominated parliament were invalid. Following this decision, Egypt's ruling military council announced that if any part of the parliament is illegal, then the entire body should be dissolved. Beltagui is a senior member of the Brotherhood’s Freedom and Justice Party, which dominated the parliament that has been dissolved. The constitutional court also ruled against a law that would have barred deposed president Hosni Mubarak's last prime minister, Ahmed Shafiq, from participating in the weekend's presidential poll runoff against the Brotherhood's Mohammed Morsi. Anonymous sources in the military council told Al Jazeera that the council will regain legislative authority and form a new constituent assembly on Friday. Shafiq welcomed the court rulings in a conference before his supporters, saying it heralded an end to an "era of political score settling." The constitutional court "has confirmed my right to participate in the election and reinforced the legitimacy of this election," he said. The law struck down by the constitutional court was approved by the parliament two months ago. It would have stripped political rights from anyone who served in top government posts in the last decade of Mubarak's regime. Channel 2's veteran Arab affairs analyst Ehud Yaari said Thursday that the Muslim Brotherhood will not accept an election result in which Shafiq emerges victorious.